Looking for a taste of Pueblo? 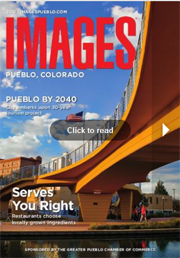 The Pueblo Images magazine sponsored by the Pueblo Chamber of Commerce offers a peek into the lifestyle we have here in Pueblo Colorado. Click on the image to view the digital version of the magazine.